Paint spills occur and the key to correctly dealing with them is twofold. Time & knowledge are the key. The knowledge is what you are about to get and how quickly you react to a spill is often the difference between an easy clean up versus a more involved cleaning process. The most important thing to remember is that whatever the solvent is for the paint, that is what you should use first to clean it up. For a Latex paint you would use water. For an Alkyd paint you would use mineral spirits. Where most people quickly go wrong is when they reach for a “cleaner” for a paint spill. Cleaners and special paint removing solvents are far down the list of things to try. A third factor, besides time and knowedge, is what the paint is on. The porosity and how delicate the surface is are also very important. Occasionally paint can get on something and by it’s very nature your screwed. For example, a delicate, white lamp shade that has red paint on it. Even after successfully getting the paint off it the tint will have stained the delicate white paper and on top of that the object essentially has a spot light on it showing the stain. I can’t help you with this one! Let’s not deal with the doom and gloom but instead highlight what can be done. Wet Paint. If the paint is wet, remove as much of it as possible with clean rags. If the paint is on a finished wood or vinyl floor your done after the wipe up. You do need to pay special attention to any seams in the vinyl or reveals or seams in a wood floor. After wiping, using a soft brush (like a tooth brush) on the seams to clean them. On carpet the process is the same. Remove as much paint as possible. If it is a small spot you can usually blot the area with alternating (clean) wet and then dry rags to absorb the paint. Success here will depend on the color of the carpet and the color of the paint. The tint in the paint will separate out of the paint and absorb into the porous carpet. Keeping the area wet and continuing to use wet then dry rags will often pull the tint out. Do not allow the area to dry until it looks right. If the area still has a stained appearance or it is a bigger spill, then you will need to use an extractor. Keep the area wet by putting wet rags on top of the spill while you go to get one. There are small hand held units that will wet an area and then extract the water from the spot. Another option is to wet the area with a spray bottle and use a shop vac to extract the water. Don’t over do it with the water. If the paint is an Alkyd then the process is the same except you will be using mineral spirits instead of water and you will use a shop vac for the extraction not some rented carpet extractor. Imagine taking the unit back stinking of mineral spirits! If the paint is on ceramic tile the challenge will be on the grout lines. Wipe the tile and use a soft brush of the grout line to scrub as much of the paint away as possible. Do not over wet the grout or spread the spot into a much bigger area by scrubbing. Often after the area has dried you will need to use a stiff brush on the grout lines to brush away any remaining image of the stain. Use the same process for brick. For other surfaces such as concrete, counter tops, porcelain, drapes, artwork,… the process is similar. Don’t damage the surface in an attempt to clean it. For example on concrete you will wipe the area up and may need to use a scrub brush because of the porosity. If so, use a stiff nylon brush. Using a metal brush risks burnishing the concrete. On concrete use plenty of water to wash the paint out and away from the surface. Dry Paint. 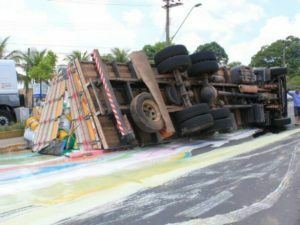 Paint spills that have been allowed to dry or were not discovered until they have dried can pose a bigger challenge. On hard surfaces you will want to wet the area with the corresponding solvent (water, etc…) and after the paint has softened scrape it away.On very hard surfaces like concrete you can sometimes simply scrape the paint and be done. On softer surfaces like carpet, the most common problem, you will want to take a wet rag and place it over the spot and leave it until the paint is soft enough to work on. This will take a process of delicate scraping and blotting. This is usually successful. Sometimes using the broad edge of a razor blade and shaving over the surface will work well. Dried paint on glass is easily scraped with a broad razor blade. Just be careful to not put too much presure on the glass. Sometimes on stubborn paint you can use a damp rag and run it on the glass where the paint is to soften it a bit and then scrape. Commercial products like Goof-Off and WD-40 can do wonders in the right circumstances however in my opinion should always be used as a last resort and you should always test an area that is not noticeable to see what it may do to the surface.